Refined vegetable oils are naturally very heat tolerant. Many vegetable oils can withstand temperatures of 450 degrees without any adverse effect. Why then you might ask, does the oil turn dark and start to impart taste to fried foods after only a day or two of use. The answer lies in the food that is fried, not in the oil itself. As food is fried, two things happen. The hot oil causes moisture in the food to turn to steam and leave the food. This dehydrates the food and creates the crisp crust that makes fried foods crunchy. Secondly, a chemical reaction occurs which causes browning of the food as well as that unique fried taste that we all love. The problems start to occur when the food is left in the oil too long. As the food continues to cook and then burn the chemical reactions create free fatty acids in the oil. These free fatty acids produce the colors and odors that we associate with “old”oil. So, the solution is to not overcook any food. That’s easy with the food that you remove from the fryer. After all, we don’t want to eat burned food right? However, when deep frying food, there are always little bits and pieces of the food that become dislodged and fall to the bottom of the fryer. This is especially true for dredged foods like chicken and fish. The flour, batter, and food biys that fall to the bottom of the fryer remain in the hot oil and burn for hours on end. This is what causes the premature breakdown of the oil. The solution is to remove these food particles from the oil and return the clean oil to the fryer for re-use. This is where BCOS comes in. Our oil management system includes a cooking oil filtration system. Our system uses a two part filtration unit – a stainless steel screen for the big bits, and a paper filter media for the small bits. Our specialized hot oil pump allows you to recirculate the oil through our filters and back in to the fryer with minimal human interaction. 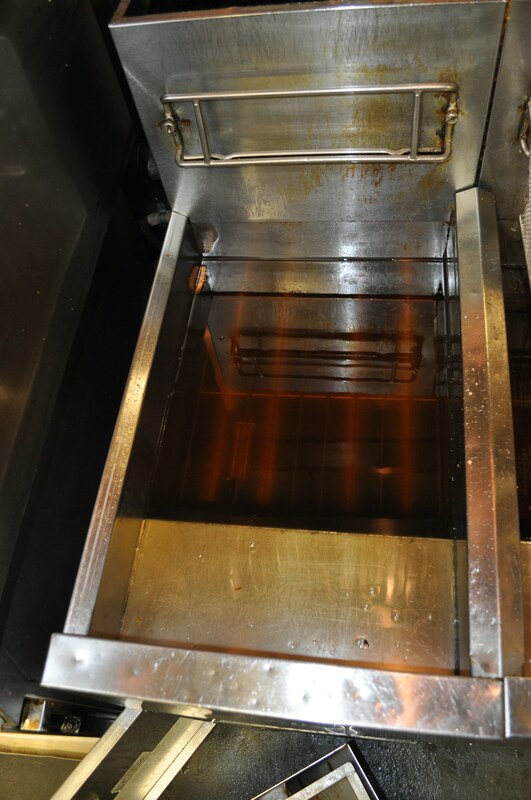 We recommend filtering fryer oil at least every day, and for high volume restaurants, after every meal shift. With our automated filtration system, a fryer can be filtered in as little as 10 minutes, so this process is simple and does not interfere with kitchen operations. Using our filtration system typically extends oil life 30% to 50% without introducing any extra flavors or odors to your food or kitchen. This can represent a significant savings to our customers.